Presto! Flex-a-Size Paper Towels are strong and absorbent, ideal for tough messes. 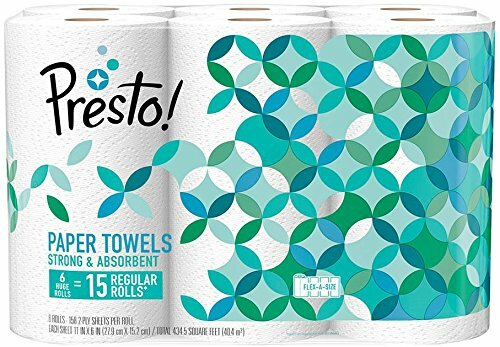 Up to 75% more absorbent versus leading 1-ply brand, each huge roll lasts 2.5X longer than a regular paper towel roll (based on a regular roll with 63 sheets). Presto! Flex-a-Size Paper Towels are PEFC certified and made with pulp sourced from sustainably managed forests and controlled sources. If you have any questions about this product by Presto!, contact us by completing and submitting the form below. If you are looking for a specif part number, please include it with your message.